Lord George Campbell : Waikiki and Surf Riding at Hilo, 1876?. Log Letters from the Challenger. Macmillan and Co., London, 1876. Macmillan and Co., London, 1881. 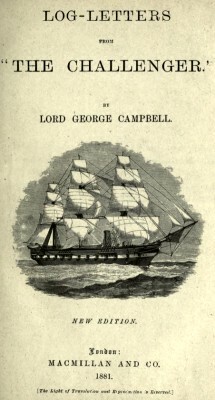 The Challenger Expedition ran from 1872 to 1876, when Campbell visited Hawai'i. - viewed 24th November 2012.
fort, make up the cheery settlement. legs, while their arms and paddles are in violent motion. and have been known in one or two cases to arrive safely. ing a while we saw a " smoothe," and in there we steamed. this reef the canoes are poled along instead of paddled. enjoyed immensely the fortnight we stayed there. cannot say I thought it a cheerful spot. deliriously exciting to act in. There is a true story of a native, whose hut, while he was within, was swept out to sea by an earthquake-wave ; he wrenched off a plank and came in surf-riding on the top of the return wave, .some fifty feet in height, and was thrown uninjured on the land. What a glorious thing to do and survive ! A sad fatal accident occurred among the English Transit of Venus party when they were here the other day ; they tried this surf-riding on a day when the surf was very heavy, and one of them was drowned. I saw more pretty native women in this village of Hilo than I did at Honolulu. Geoff Cater (2012) : Lord George Campbell : Waikiki and Surf Riding at Hilo, 1876.